Ben and Erin left for Rome 2 days ago and I was alone aboard Heldeleine for a day during laundry, general toilet cleaning (!) and prepping the boat for the next crew. Ben and Erin were good crew and I wish them the best in Rome and safe travels home! Yesterday I welcomed aboard Antonio (Tony) Traettino and his wife Anastasia and also Antonio Arcaro. Tony is with the Italian Coast Guard and Antonio is in the Italian Air Force. Anastasia teaches language studies. Tony has become a good friend after we met while I was clearing into Italy. He and his wife have been amazingly wonderful to me during my stay in Gaeta. Taking me to dinner, breakfast etc. Just fantastic people. 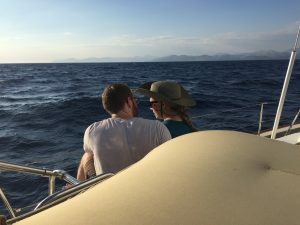 In a small way I am trying to repay their kindness with an overnight cruise to Ventotene aboard Heldeleine.We had a glorious sail yesterday and are currently parked along the sea wall in the new harbor on Ventotene. We had a great dinner with the Commander of the Coast Guard tonight followed by….Gelato (of course). 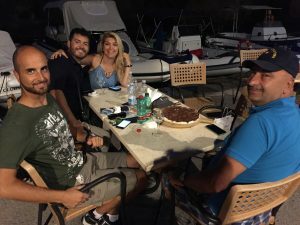 Antonio, Tony, Anastasia and the Commander with a Nutella Pizza…. It is morning now and we are off to Breakfast prior to a return to Gaeta. Good times with great people. I can’t thank them enough for their overwhelming generosity. Fantastic. You are living the life!